ICT Solution Business Division｜AGC Technology Solutions Co., Ltd. This group is main player, applying ICT into production line in AGC Inc.
We handles instrumentation, equipment control system, and production control system in factories. Our activity would contribute to the growth of AGC group. ● Design work, manufacturing, construction at site, and commissioning work of equipment and system as a digital factory for glass plant. Digital factory: It is the method introducing the system linkage between field level and the MES level by using IoT. Aiming to realize excellent factories through high productivity and continuous improvement. ・Realize analytical technologies and Cloud technologies from field information connections and equipment maintenance information. 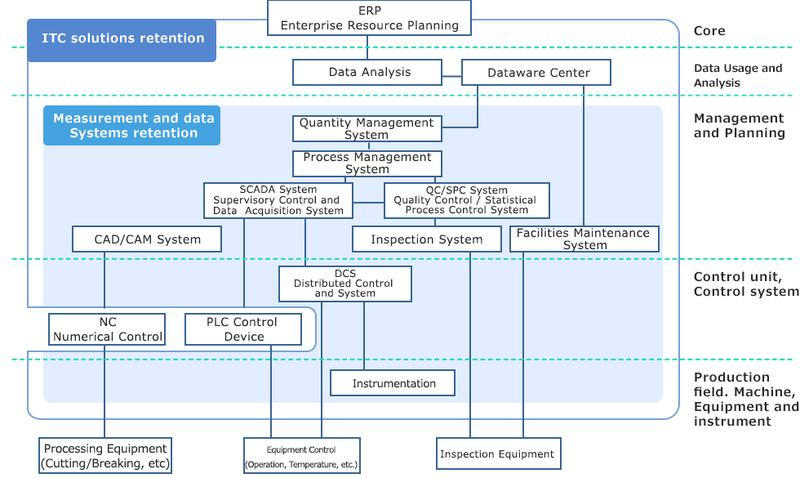 ・Hold technical skill of design and manufacturing for instrumentation field. Measurement methods, equipment selection, procurement and commissioning for glass production line. - This group uses software design and production technologies to propose CAD/CAM, SCADA monitoring, recipe management, and process management as system solutions for glass production lines.